These are words that are important to Greeley's history. Click on a word to hear it pronounced. A brick or building material made of a sun-dried mixture of mud and straw. It is used a lot in Mexico and the Southwest for homes. This is an adobe brick. Here is a movie on making adobe from Potato Days. 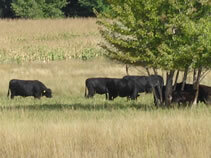 Some cattle grazing. 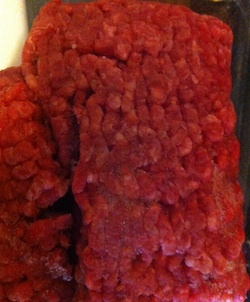 This is an example of livestock. A cow. 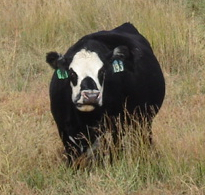 This is the most common livestock raised in the Greeley area. Corn. 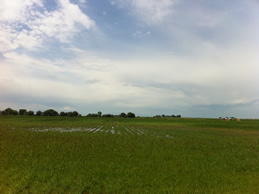 A crop grown near Greeley. 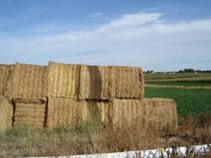 Haybales. 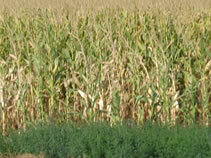 Another crop grown in Weld County. Here is a picture of the Pawnee Buttes located near Greeley. a group of similar (alike) people living together. A person who moves to a new country to live. 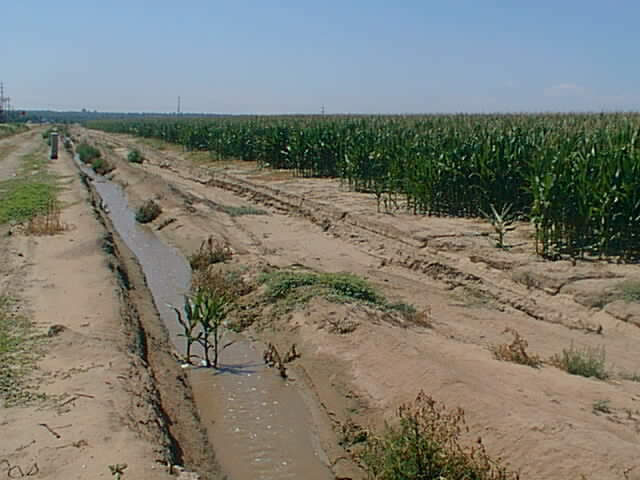 To water an area by man-made (artificial) ways to grow crops or plants. Watering can be done by spreading, sprinkling, or dripping. Many places irrigate by digging a ditch for the water to run down between rows of crops. 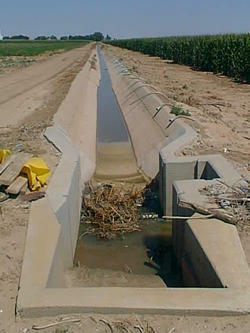 People irrigate because of the scarcity of natural percipitation. These are pictures of a couple of irrigation ditches in corn fields. The water is low because it is getting close to harvest. 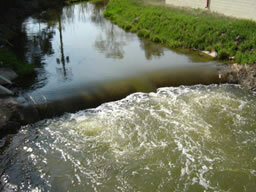 Click on the picture on the left to see a short Quicktime Movie of the irrigation ditch. 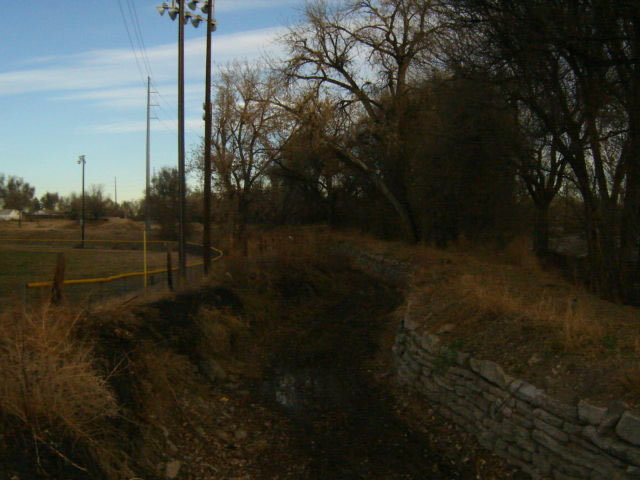 Here is one of the original (first) irrigation ditches in Greeley. This is the #3 ditch. It is dry because it is after harvest. Here is a second picture of the #3 ditch. It is dry because it is after harvest. Ditch #3 in spring. Notice how much more water is in the ditch for planting season. 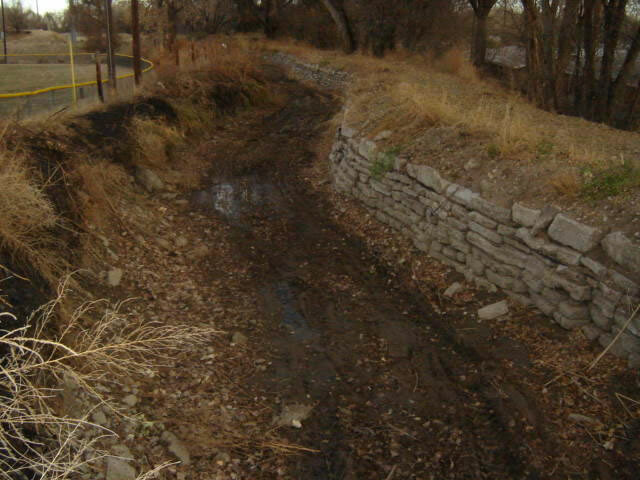 Ditch #3 in spring. Notice how much more water is in the ditch for planting season. Here is a short movie of the #3 Ditch and some other irrigation ditches. a brutal killing of people. A worker who moves from place to place during the seasons to work. Usually on farms. An area with light rainfall. Precipitation is scarce. Here is a Frayer inspired slideshow for a few of the words. May be best as a presentation by teacher. Once you click the play button, it is self-playing. Here are other social studies words to help understand Greeley. Here is a panorama showing downtown Greeley on a late Sunday afternoon. It shows an urban area. 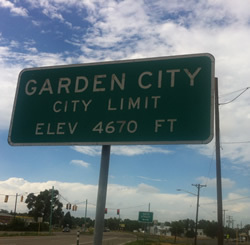 Garden City is a suburb of Greeley. 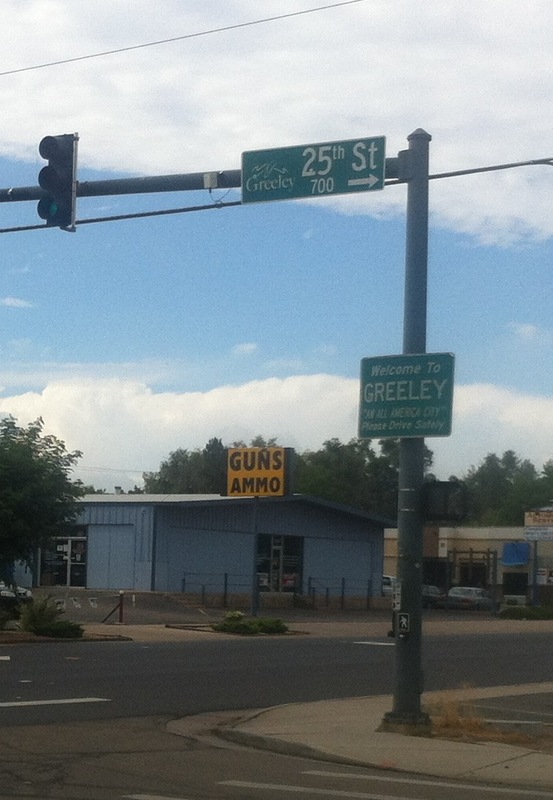 It is a much smaller town near the city of Greeley. Here is where the border of Garden City meets the border of Greeley. Here is a panorama of Severence, Colorado. 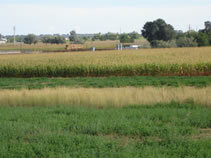 It is a rural area. Goods are things to buy. You can touch and use a good. Goods are object based. Services are when people do things for you. Service is action based. Services use goods. 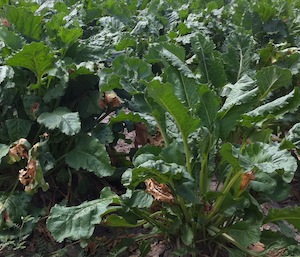 You can make sugar from a sugar beet. You can pick it. It is an object. It is a good. 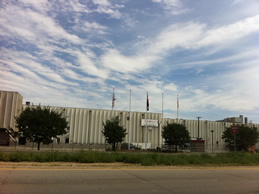 A sugar beet factory gives service. 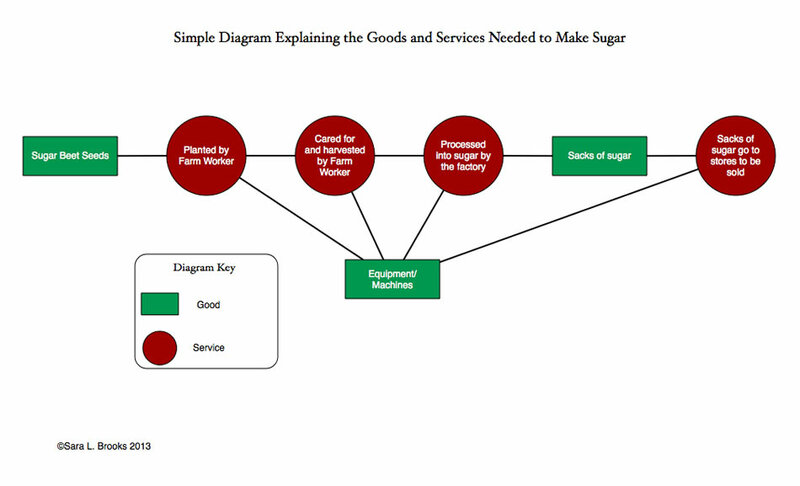 It takes the sugar beet (a good) and makes it into sugar which is an action. Often a service business will make goods. 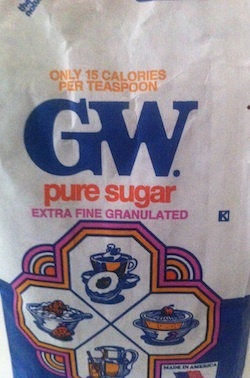 This sugar is a good made by the factory as a service. You can use a cow for beef and dairy products. It is an object. It is a good. JBS gives service. 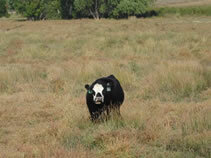 It takes cattle (a good) and makes it into beef for grocery stores to sell (another service). It is action based. Often a service business will make goods. This ground beef is a good made by JBS as a service. 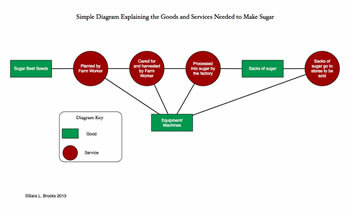 This simple diagram shows the different goods and services needed to get sugar to our tables.